Sir William Siemens, in 1871, proposed a thermometer whose thermometric medium is a metallic conductor whose resistance changes with temperature. The element platinum does not oxidize at high temperatures and has a relatively uniform change in resistance with temperature over a large range. The Platinum Resistance Thermometer is now widely used as a thermoelectric thermometer and covers the temperature range from about -260°C to 1235°C. Several temperatures were adopted as Primary reference points so as to define the International Practical Temperature Scale of 1968. The International Temperature Scale of 1990 was adopted by the International Committee of Weights and Measures at its meeting in 1989. 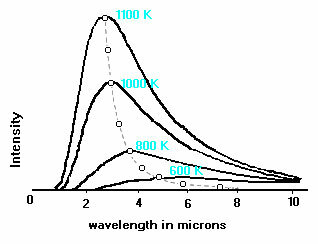 Between 0.65K and 5.0K, the temperature is defined in terms of the vapor pressure - temperature relations of the isotopes of helium. Between 3.0K and the triple point of neon (24.5561K) the temperature is defined by means of a helium gas thermometer. Between the triple point of hydrogen (13.8033K) and the freezing point of silver (961.78°°C) the temperature is defined by means of platinum resistance thermometers. Above the freezing point of silver the temperature is defined in terms of the Planck radiation law. 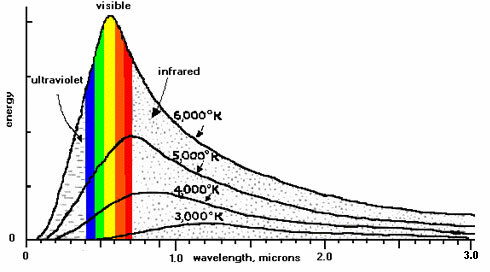 The sun is not the only object that provides radiant energy; any object whose temperature is greater than 0 K will emit some radiant energy. The challenge to scientists was to show how this radiant energy is related to the temperature of the object.